The Greek Community of Melbourne is proud to present a celebration concert of Mikis Theodorakis with Romiosini and Beyond to be performed at Melbourne Recital Centre on Friday 17th May 2019. This exclusive one performance only two-part concert will feature the music of Romiosini conducted by George Ellis. 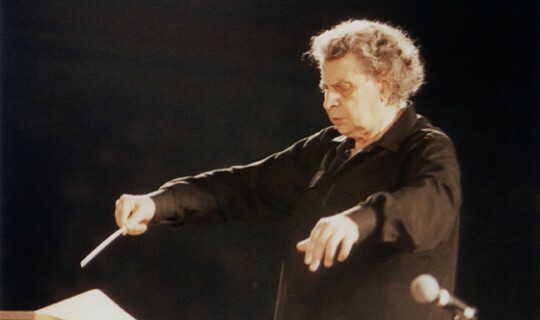 Mikis Theodorakis is the greatest orchestral and choral composer in Greece’s musical history. In this two-part performance the first half is the works by Mikis Theodorakis Romiosini, which the great composer wrote in 1966, a Cycle of Songs based on the poetry of Yiannis Ritsios, winner of the Lenin Peace Prize in 1975. It describes the hard-fought struggle and the ways to be proud of all things Greek. The second half is popular music by Mikis Theodorakis including “Zorba” and his work in cinema. The word romiosini or “Greekness” derives from the Byzantine idea that the Greeks are the true Romioi. the true heirs of the Roman Empire. For hundreds of years under the Turkish occupation the flame of romiosini hundreds of years under the Turkish occupation the flame of romiosini was kept alive in codes of honor, loyalty, bravery, love of the land, religious devotion and patriotism. The second half of the concert will feature the ever-popular songs of Mikis Theodorakis where the orchestra and soloist will be joined by a band of Greek instruments including the popular Bouzouki. It is known that the great composer wrote the music to Zorba the Greek – he also wrote so many songs that have become part of the Greek Standard repertoire. To say that Mikis Theodorakis’ life has been tumultuous is an understatement. He is far much more than Greece’s favourite composer. He has become a symbol of modern Greece and the most beloved Greek public figure. His life mirrors the history of Greece in the 20th century and his life-long struggle for freedom, quality and justice epitomises the struggle of the Greek people. Born on 29 July 1925, he wrote over 1000 songs. He scored for the Academy Award winning film Zorba the Greek and was nominated for the Hollywood Press Association Award for Best Original Score. The main theme for Zorba the Greek whose main theme, since then, exists as a trademark for Greece. He also wrote for the film Z and Serpico. He fought during WW11 and was captured in Tripoli. He was tortured and when he was set free, he joined the army of Greece, and took part in the civil war during 1945-49. Arrested, he was exiled on the island of Ikaria in 1947, was then transferred to the island of Makronisos in 1948 where he was tortured again and barely survived. When he was released, he moved to Paris to continue with his studies in music. He composed continuously. He has put to music the work of leading poets, such as Odysseus Elytis, Pablo Neruda, Brendan Behan, Federico Garcia Lorca, George Seferis and Yannis Ritsos. He has composed the national anthem of Palestine. He has become a symbol of resistance proving that music has no borders. Throughout his life he has remained true to his principles, has never compromised and has fought during Greece’s darkest and most difficult times always hoping for a brighter future. No wonder he is such a loved and respected figure in Greek public life. In May 2005, he took part in the celebrations in honour of the eightieth birthday Mikis Theodorakis. Dimitris Basis is a Greek singer and musician from the village of Cherso near the city of Kilkis in Central Macedonia. Born in Stuttgart, he parents lived in Germany for many years, he came to Greece for the first time at aged eight when his entire family returned to Herso, a small village near the Greek-Macedonian border. At age nine, he started chanting the liturgy in the local church and three years later he began to study Byzantine music. Gaining his diploma at the age of seventeen he used to sing at many cultural celebrations. At twenty years old just after his first steps in professional singing he was discovered by Stamatis Kraounakis and Warmer Music Company who offered him a contract. When he released his first album it was a tremendous success with over 120,000 sales. Dimitris voice started to be heard not only in Greece but abroad as well. He has performed all over the world and previously in Australia is a series of concerts with Irini Haridou. George Ellis is an internationally-acclaimed orchestral conductor, composer and arranger in Sydney. He conducted the Sydney Symphony Orchestra and millennium Choir at the Opening Ceremony of the Sydney Olympic Games in 2000 and was Musical Director and Conductor for the Athens Olympics. He has presented concerts internationally conducting in Paris, London, Amsterdam, Brussels, New York, Boston, Los Angeles, Athens and many more.